The branch of the Lincolnshire Library in Sutton Bridge at the Village Hall has closed. Library service is now only by a mobile unit which comes only once a week. The nearest permanent Library is now at Long Sutton. A cemetery of 1 acre was created in 1845. Sutton Bridge parish was in the Long Sutton sub-district of the Holbeach Registration District. To find census records at Family History Library (FHL) in Salt Lake City, look under "Long Sutton". We have a partial 1901 Census extract provided by Margaret Rackham. You can also perform a more selective search for churches in the Sutton Bridge area or see them printed on a map. The Anglican Church is dedicated to Saint Matthew and is the only flintstone church in Lincolnshire. It was consecrated on 29th August, 1843. The ecclesiastical parish was formed in 1843 and included the civil parish of Central Wingland, across the River Nene. Saint Philip's Mission Church (originally a Chapel of Ease), at Guy's Head, was built in 1869. Richard CROFT has a photograph of St. Matthew's Church on Geo-graph, taken in September, 2009. Parish registers exist from 1841. Previous entries are in the Long Sutton register. Copies of the registers, covering 1841 to 1937 are on file at the Lincolnshire Archives. Microfilm of these records are also available through your local Family History Centre, a branch of the Family History Library (FHL) in Salt Lake City. You can also order a microfiche of the births and christenings at St. Matthew, covering the years 1841 to 1875, from your Family History Centre. The fiche number is 6908009. Sutton Bridge is in the East Elloe Deanery, for which several indexes have been published. The Wesleyan Methodists had a small chapel here, built in 1836. The Primitive Methodists built one in 1865 and the United Methodists built their's in 1855. For information and assistance in researching these chapels, see our non-conformist religions page. The parish was part of the Long Sutton sub-district of the Holbeach Registration District. Sutton Bridge (known in ancient times as "Cross Keys Wash") is both a village and parish about 105 miles north of London, about 13 miles east of Spalding and 8 miles north of Wisbech. The county of Norfolk forms the eastern and southern border and the River Nene flows past the village on its northward journey to The Wash. The parish is large in area and includes the hamlet of Guy's Head near The Wash. The area is marshy, drained by many small canals and the South Holland Main Drain, which empties into the River Nene just south of the village. The A17 trunk road runs just south of the village. The B1359 runs through the village. Mat FASCIONE has a photograph of the Guy's Head area on Geo-graph, taken in September, 2012. There is a Community Group for Sutton Bridge. Keith EVANS has a photograph of Cross Keys Bridge on Geo-graph, taken in May, 2008. Passenger rail service ceased in 1959. Ask for a calculation of the distance from Sutton Bridge to another place. You can see the administrative areas in which Sutton Bridge has been placed at times in the past. Select one to see a link to a map of that particular area. In 1825 an Act of Parliament saw the beginning of Sutton Bridge. Long a place where wagons and carriages were guided across the Wash, sometimes with the loss of cargo or lives, the Act allowed the river to be dredged, a large embankment built along the course of the river and a bridge, a bridge that was a technical marvel of its time, built to allow passage to Norfolk without anyone getting wet. Completed in July 1831, soon a number of wharfs and warehouses were built along the river banks. The orginal bridge was replaced twice, lastly by a swing bridge in 1897. A gas works was built in 1856. On 1 June 1862, the Great Northern Railway line from Holbeach opened. On 1 November 1864, the Great Northern Railway line to Kings Lynn opened. In May, 1881, the Sutton New Bridge Dock opened, covering 13 acres. The dock was 1,415 feet long. The parish was formally incorporated in 1894 as a civil parish out of Sutton St. Mary. The parish covers 6,176 acres. Pictures of the parish are available at FreeFoto. The Peter Scott Walk is a trail along the banks of The Wash, which begins at the lighthouse home of the famous naturalist and painter in Guys Head. He is often described in England as the "father of conservation," and is one of the founders of the World Wildlife Fund. Mat FASCIONE has a photograph of the Greyhound public house on Geo-graph, taken in June, 2013. This Inn is a popular spot for discussing local history. RAF Sutton Bridge was opened in 1926 as a gunnery range. In January, 1932, the station was renamed as "No. 3 Armament Training Camp". The station got its full airfield in 1936. In October of 1939, RAF squadron 264 was reformed at Sutton Bridge and given the Boulton Paul Defiant to fly. By December, they had moved to Suffolk. RAF Sutton Bridge was inactivated in 1946, at War's end, and closed in 1958. After the War, the station was used as a potato storage lot. In St. Matthew's Church there is an RAF Memorial Chapel in the north aisle. This was dedicated on 19 March 1957. There is a Roll of Honour in the RAF Memorial Chapel in St. Matthew's Church. The name Sutton Bridge is from the Old English suth+tun, or "southern village". It is believed that the name derives from Long Sutton and the "Bridge" was applied when the village developed around the bridge over the River Nene. The village had a local governing board in 1859, but this became an Urban District Council when the parish was formed in 1894. The parish was formed in 1894 out of Sutton St. Mary civil parish. The parish has a joint Parish Council with Wingland parish. You may contact them regarding civic or political matters, but they are NOT staffed to assist you with family history questions. For today's district governance, visit the South Holland District Council site. The same restrictions apply. 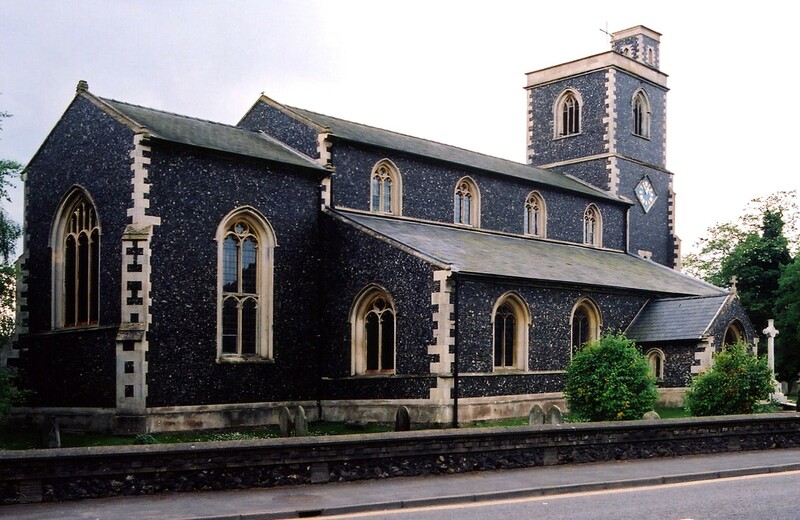 At its formation in 1894, the parish became part of the Holbeach Poor Law Union. A Public Elementary School was built here in 1878 under the direction of the Long Sutton School Board to hold up to 450 children.